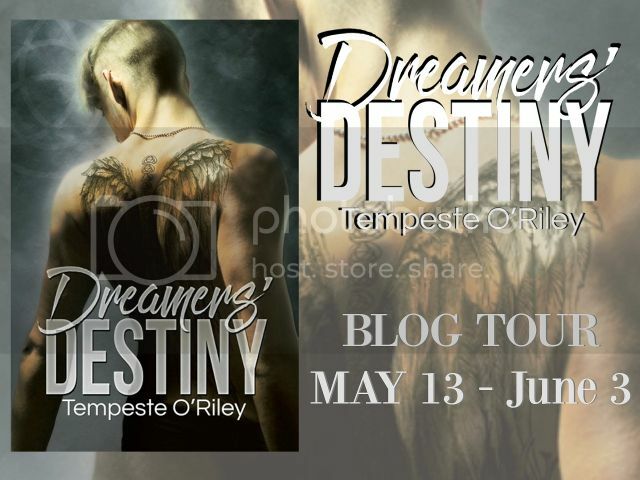 Dreamer’s Destiny: New Release by Tempeste O’Riley, excerpt & giveaway! 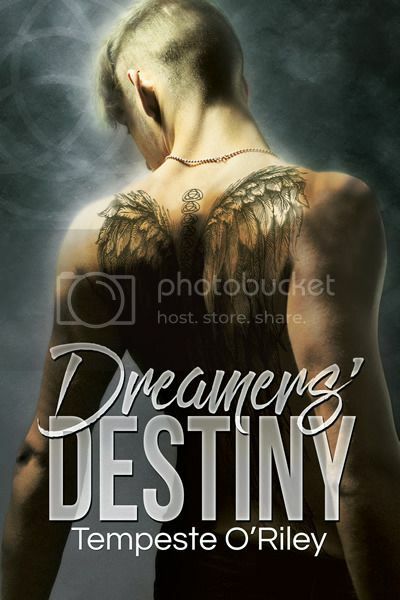 Welcome to the Dreamers’ Destiny Blog Tour. I want to begin with special thanks to Dreamspinner Press Blog for welcoming me today. I hope you’ll follow the entire tour. There are plenty of chances to win a signed paperback copy from my backlist, $25 at Dreamspinner Press, an audiobook of either Designs of Desire or Caged Sanctuary, and more! Each tour stop will feature an excerpt along with some question that relates to the post. Check the Rafflecopter at the end of the post to enter your answer to the question. A few stops will have special (additional) giveaways as well, so make sure you check out the whole post! Now, let’s see what I have for you today…. Which comes first: the story, the characters, or the setting? For each author it’s different. For each story it’s different. For me, it’s usually the character that comes first. Yes, not the characters, but the character. I usually have one that comes and pokes me until I begin writing about him, then I meet his to-be-partner and boom, find the story—though sometimes the story is a little harder for me to figure out. They don’t always tell me upfront what’s going on. That was true in Whiskers of a Chance. However, in Dreamers’ Destiny I was challenged to write a story that was pagan based, that might skirt into paranormal but that wasn’t full on PNR (Not Potter-esque was how he worded it, lol). I worked on the basic idea of what I wanted to write about, deciding on dream walking. Then I met Liam and Cam when the first seen in the book happened, lol. If you read it (Chapter 1 is available on Dreamspinner Press free) you will see that everything kind of happened all at the same time past that point, lol. I met my guys, it was obviously contemporary, and well, Liam was the dreamer. Still, it’s always fun for me to see which comes first to me, the idea for the story or the guys that will be the leads in the next book. The setting is always dependant on the first two, so that’s never a first for me 😉 Happy reading! People don’t just materialize into reality simply because you want them to so desperately that waking up breaks your heart. Cameron Danu is a tattoo artist from rural Georgia. Cameron is left without a job after his boss, Jose, is forced to close the shop after a heart attack. When Cameron learns Jose has set up an interview for him at a small tattoo parlor in Asheville, he hopes for a fresh start in a new town. Excerpt: Liam walked beside Cam, noting every nuance of the man he’d been with most of his life, even if they’d never met while awake before. He was entranced with how Cam moved. He thought of the way Cam had spoken using his hands to emphasize and punctuate his voice when they were inside the tattoo shop, and even the little sidestep to separate them didn’t surprise or bother Liam any. Liam had expected it, truthfully, but he’d needed to feel Cam, to know he wasn’t imagining all this, either—that fleeting touch in the tattoo shop hadn’t been nearly enough. Working with Nosha the last couple of weeks had been interesting, and he’d started to believe Cam might be real. However, seeing and touching Cam was very different from trying to willfully take control of his dreams or debating Cameron’s possible existence. And touching him? Liam suppressed a shiver as he opened the door for Cam to enter the little coffee shop. “Thanks,” Cam murmured. “You always do things like this in the dreams too,” he added so softly Liam almost missed it. Liam smiled, hoping Cam could adjust to this new knowledge and glad he’d noticed how Liam acted both in their dreams and now. Thankfully, it wasn’t busy right then, so they got their coffees and were seated at the farthest table from the other patrons in a few minutes. Liam waited, watching Cam as he fidgeted with his cup, steadfastly refusing to meet Liam’s eyes. He blinked hard as he thought about what to say and which questions to even answer. Tempe is a hopeless romantic who loves strong relationships and happily-ever-afters. They has done many things in their life, yet writing has always drawn them back—no matter what else life has thrown their way. They counts her friends, family, and Muse as their greatest blessings in life. They lives in Wisconsin with their children, reading, writing, and enjoying life—especially now that they have joined the Sisters of Perpetual Indulgence® (as Novice Sister Eroti-Quill… can’t imagine where that name came from). Thanks for the post! I always enjoy learning how authors create their stories. I tend to go for characters first, and Liam and Cam sound delightful!